Welcome! I hope you will enjoy my "efforts". Now you too can own a piece of history. 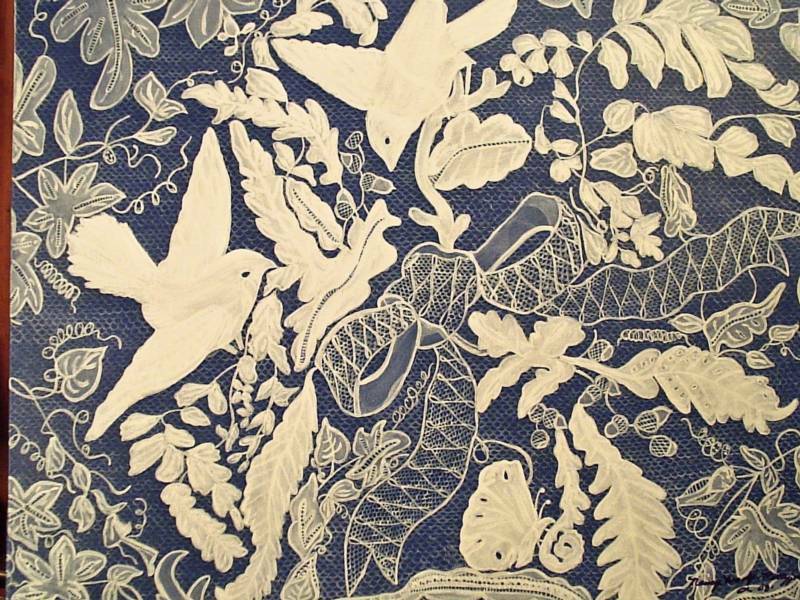 My name is Nancy Anne Woolf-Pettyjohn an artist of Historic Laces from around the world. From my extensive research as well as in talking to museum curators and directors the world over, publishers, and on the Internet I am told that I am the only artist in the world to paint authentic historic laces only. Each lace is authentically painted by hand using acrylic paint and each stitch of the different netting painstakingly done given an attention to detail. All paintings come unframed and are painted on museum quality acid-free canvas. All of my work has had prior copyright permission to use whether from museums from around the world, authors, photographers, publishers from around the world or private collectors. On the back of each painting I have a label that states the original textile and original date, original lacemaker if known, the date of my copy, any historical significance known, and who I have copyright permission from. All paintings for sale shall be numbered. All inquiries are most welcome as well as comments about my art work. Custom requests are also accepted. Custom prices will vary according to type of lace, how detailed, size and time involved. On custom requests three months will be needed to finish a painting unless otherwise written in response. Museum and Gallery inquiries are also welcome. Lace making goes back to Biblical days when Jewish temple curtains were trimmed with embroidery. Since 1100's-1200's men wore lace underneath their suits of armor. In 1115 Royalty started wearing it such as Henry I wife Matilda. Henry II wore a lace ruff to cover his scarred neck. In 1415 lace became the universal dress of Royalty. Men, women and children became lace makers the world over for centuries. The wealthy down through the ages have always commissioned lace makers from convents, and individuals from Chantilly, Venice, Genoa, and Brussels. Since lace making played a big part in a nation's economy rigid rules were set in place. Only the wealthy could afford it as the special talent, skill and love it took to make was often made using a single thread and needle. To make even the smallest piece of lace often took literally months. During the revolution of the Edit of Nantes, they sent 4,000 lace makers away from Alencon. Many of these lace makers went into Amsterdam, Holland. Then the Elector of Brandenburg edit had lace makers fleeing to Germany. Soon France realized her mistake and her economy was suffering. France began importing lace. Flemish lace has always been highly sought after to this day. Under the reign of Napoleon I, France decided to start smuggling lace from other countries. He had tried to re-establish the lace industry but had miserably failed. In a sixteen year period they starved to death 40,278 dogs! Skin was stretched over their emaciated bodies and stuffed with laces. They also rolled up laces and placed under the bodies of deceased people in their coffins. Lace became so powerful that one country plotted against another. Many countries economy was suffering resorting nations to stoop to smuggling. Smuggling was done by any number of ways that included pirates, dogs, coffins, doll boxes, food and sheer greed. Historically, men of good standing were known to mortgage their properties to buy it during the sixteenth and seventeenth centuries! At one stage things got so out of hand that France banned trade in lace to stop the country's entire output from being shipped out. In a story by Thor Jensen that appeared on the Internet...WWW II Soldiers used lace curtains as snow camouflage on their helmets! 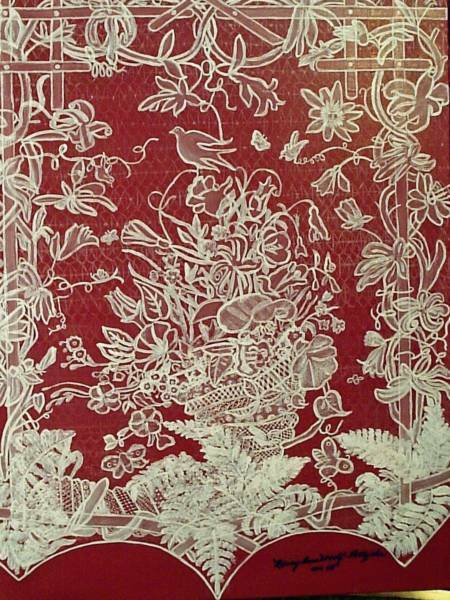 Lace is both historical as well as Fine Art. Note: Thank You to everyone who has been kind and supported my "efforts"! NOTE: No endorsements have been made in any way whether written, expressed or implied by these comments listed below or monies exchanged. It just goes to show that certainly art touches our very senses! I think this is your gift of what you were meant to do in life! Allhallows Museum Curator, Historiographer, Administrator Margaret Lewis: ...Some people have even thought it's real lace so that really is a compliment! Trustee Heather Toomer of The Costume Society in England,respected expert and museum advisor, authority of old lace and white embroidery, etc. : Impressive indeed! The results are absolutely splendid! 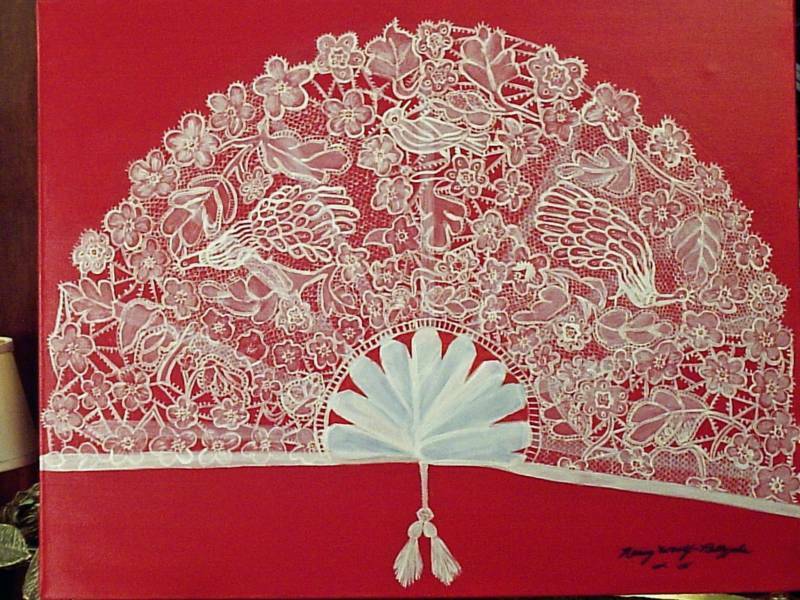 Holly Bedrosian Fine Art...Your lace art is incredible! I have never seen something like that. Great work! ...truly an art of rare quality and who would have known the part lace had in the past. The work look like it was done with a microscope. Never seen anything like it! So beautiful! Wow! The ONLY person in the world doing this art. Amazing talent...this is really something special. This is the most beautiful thing I've ever seen !!!!! 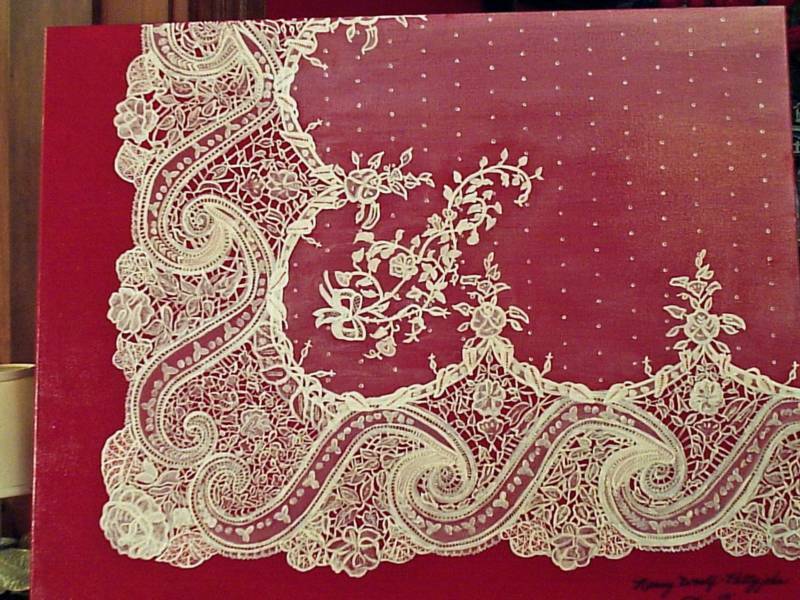 The lace pictures are beautiful. I had a look at your site your work is amazing. When I looked at your pictures they remind me of the Hand drawn patterns which the Irish were worked on, which were usually drawn in White ink on a dark background and were as much a work of art as the actual lace - without the skill of the pattern designers there would be no lace ! It looks so real it gives me goosebumps! Literally! Look at my arms! They are all so beautiful it makes me want to cry! House of Elliot Collection: Clearly you are a talented lady! Gulf Stream Media Group: unbelievably beautiful. What a great gift God has given you. Interweave Press: I don't know how you do it, but the more I learn the more intrigued I become! Absolutely intricate an incredible amount of patience and talent. St. Louis Art Museum: ...work is intriguing. National Museum of American History: Impressive paintings of laces...interesting work. Allhallows Museum Curator Margaret Lewis: Not all the Trustees could get to the museum on Wed. because of the snow but when we opened the parcel there were lots of Ooohs and Wows!! This is very intricate work. Amazing. St. Louis Home Magazine: ...very intrigued by your work. Your lace work is absolutely beautiful...you should be so proud. Wow! Nancy, you do absolutely beautiful work! Allhallows Museum Curator Margaret Lewis: The pictures are lovely!!!!! My husband recognised it and I did not even think he took notice of it! I was amazed at the beauty of your work, such patience and detail! The Trustees at Allhallows Museum according to the curator: they loved it 4 men 6 women. The Jewish Museum Curatorial Program Coordinator - I'm delighted to have shared these materials with my colleagues. Kathy Ireland model, actress, and CEO of her own brand name products:...read with much interest ...beautiful website! Leigh Keno antique expert, author, tv host and owner of Keno Auction House-Your work is beautiful!!! I am amazed at the detail!!! ...looking through your website. I am astounded! It is really beautiful, and actually took my breath away. I'm telling you-it took my breath away. What a marvelous talent you have been given. ...you are very talented...keep up the wonderful work. ...looking at your art I am reaaly impressed. Amazed you could paint it so life like. Wonderful. ...also really enjoyed your portraits it takes a true talent to make a painting come to life as you have. 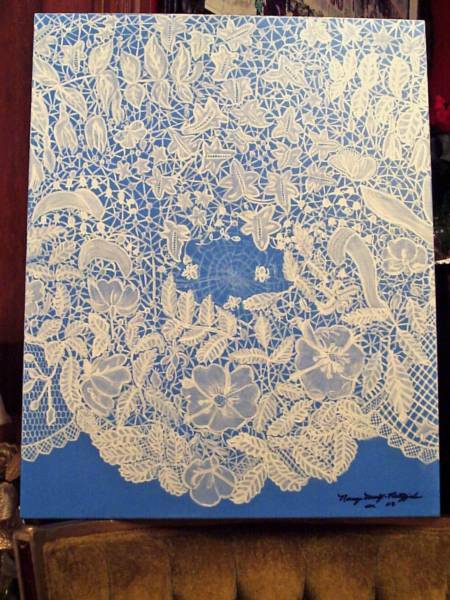 You do some great work with the lace paintings, that's pretty impressive, Nancy! Her Majesty (Queen Elizabeth II) has written me via her Lady-in-Waiting three times as to her interest on my art as well as wishing me great success on my exhibit. "special artwork". Thank You to everyone who has taken time from their own busy schedules to share with me your opinions of my Artwork. Florals: Edmund's Roses ...Exquisite and unique! from another...your work is even better than Georgia O'Keefe's! WHAT IS A GOOD INVESTMENT IN ART? Always Hand Painted & Painstakingly Accurate! My work is never done by painted photo enlargements or laser. Solely done with my own hand and eyes! and start creating a little history of your own? My website contains not only historic laces but my own interpretations of world famous paintings by the Old Master's as well! Don't forget landscapes, still life, floral, western paintings are also available and are on the website as well. ALL PAINTINGS ON MY WEBSITE ARE AVAILABLE IN GICLEE' PRINTS, ASK FOR PRICES. My artwork is for all as my talent comes from God. I cater to all my clientele whether it be galleries, museums, and connoisseurs of fine art looking for investments or just the person who would love a good painting to enjoy for themselves. Art should be for all to own and enjoy.